July Wood News just released! 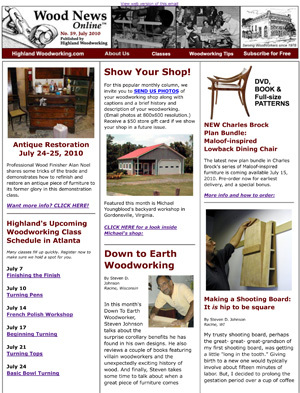 The July issue of Wood News is out, and packed full of great articles and deals. The Down to Earth Woodworker, Steven D. Johnson, has written two entertaining articles this month: his usual column on Down to Earth Woodworking and a bonus article about building an even more useful shooting board. Check them out! Alan Noel provides some excellent advice on color matching in wood finishing, and Sean Headrick offers a primer on woodworking and joinery modeling basics in Sketchup. This free program is so cool, and can really add a boost to your woodworking projects! We have new entries in our Show Us Your Shop and Show Us Your Stuff columns: this month we highlight Michael Youngblood’s well equipped backyard shop as well as Ron Norris’ impressive carvings and woodworking. And as usual, we have tons of great deals for you, and a full schedule of seminars to sign up for – check out Peter Galbert’s week-long windsor chair workshop if you want a real treat! Enjoy the Wood News this month, and keep having a great summer!